A cheats move to switch the dice in a street game is the Two-Hand Palm Switch. This move is a variation on the Palm Switch, which is a lot easier to perform and will take a lot less practise to perfect. The cheat starts this move by palming the crooked dice in one hand and picking up the straight dice with the other. 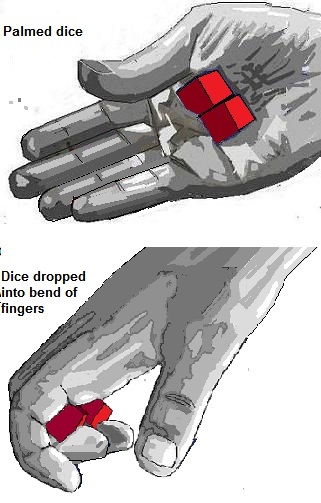 The crooked dice are then dropped into the bend of the fingers while the straight dice are placed in the palm. The cheat then rubs his hands together in the characteristic way craps shooters do for luck. This is when the crooked dice are taken by the other hand and then thrown out. To switch the dice back, just repeat the move with straight dice and crooked dice held in reverse.